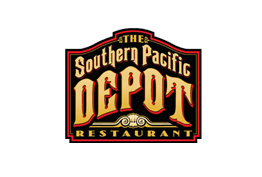 Gift certificates from The Southern Pacific Depot will provide a unique dining experience that will be fondly remembered for many years. With our extensive menu for lunch, dinner, private dining, fine wines and cocktails, we have something for everyone to enjoy. Note: tax and gratuity are not included in prices shown. Tax will be added during checkout process. Gratuity can be added at time of use. We welcome you to purchase gift certificates for all the special people in your world and enjoy secure online payments. Certificates are valid for all purchases. Delight your loved ones with fresh roses and seasonal blooms. We will place the arrangement on your table with a keepsake card. Please allow 48 hours notice. Elevate your occasion with a bottle of wine or chilled champagne awaiting your arrival. After submitting your online reservation, order your selection here using the same name. Gift certificates will be sent to you unless otherwise noted in the box called add special instructions to seller on the final page before payment. In this box, simply provide the full shipping address for the recipient – and any other notes to help us. Alcoholic beverages will be sold and served only to qualified adults (age 21 and above) in accordance with state law. Gift certificates will be applied to each guest’s folio. Based on selections from our menu, an additional amount may be payable. Similarly, any residual amount may remain. In these instances, the remaining value will be returned in a new certificate for future use. Gift certificates do not expire. To provide our finest service, we recommend reservations prior to the use of any certificate. Never miss an event or special announcement! Join our e-news community and get the latest information sent directly to your inbox. top notch! Whenever my wife and I can get an evening free from the kids...this is where we always go!"